10 n AudioFile/www.audiofilemagazine.com On the Blog: Aurelia's Audio Adventures How often do you tell someone about a book you love and finish by saying, "Of course, I'm talking about the audiobook"? A lot? Me too. It hap- pened recently when I recommended Natasha Pulley's historical fantasy The Bedlam Stacks. I'd been nattering away for a bit before realizing that while the other person was discussing the book, I'd been lauding the book and David Thorpe's amazing performance. 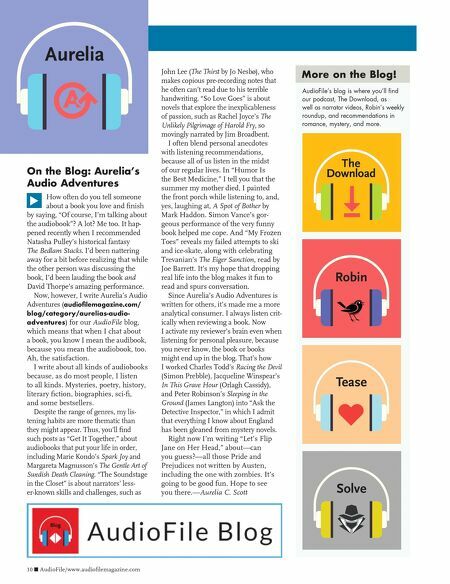 Now, however, I write Aurelia's Audio Adventures (audiofilemagazine.com/ blog/category/aurelias-audio- adventures) for our AudioFile blog, which means that when I chat about a book, you know I mean the audibook, because you mean the audiobook, too. Ah, the satisfaction. I write about all kinds of audiobooks because, as do most people, I listen to all kinds. 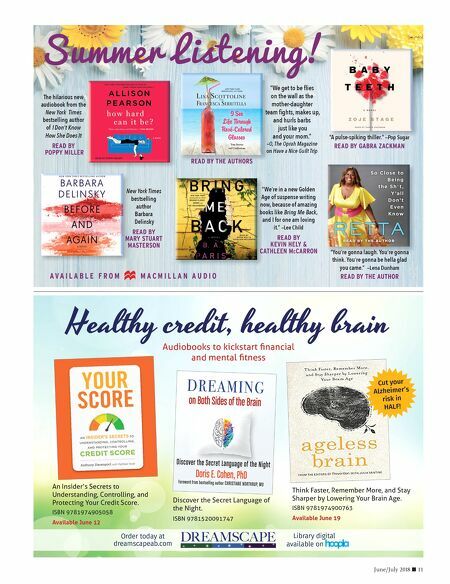 Mysteries, poetry, history, literary fiction, biographies, sci-fi, and some bestsellers. Despite the range of genres, my lis- tening habits are more thematic than they might appear. Thus, you'll find such posts as "Get It Together," about audiobooks that put your life in order, including Marie Kondo's Spark Joy and Margareta Magnusson's The Gentle Art of Swedish Death Cleaning. "The Soundstage in the Closet" is about narrators' less- er-known skills and challenges, such as John Lee (The Thirst by Jo Nesbø), who makes copious pre-recording notes that he often can't read due to his terrible handwriting. "So Love Goes" is about novels that explore the inexplicableness of passion, such as Rachel Joyce's The Unlikely Pilgrimage of Harold Fry, so movingly narrated by Jim Broadbent. I often blend personal anecdotes with listening recommendations, because all of us listen in the midst of our regular lives. In "Humor Is the Best Medicine," I tell you that the summer my mother died, I painted the front porch while listening to, and, yes, laughing at, A Spot of Bother by Mark Haddon. Simon Vance's gor- geous performance of the very funny book helped me cope. And "My Frozen Toes" reveals my failed attempts to ski and ice-skate, along with celebrating Trevanian's The Eiger Sanction, read by Joe Barrett. It's my hope that dropping real life into the blog makes it fun to read and spurs conversation. Since Aurelia's Audio Adventures is written for others, it's made me a more analytical consumer. I always listen crit- ically when reviewing a book. Now I activate my reviewer's brain even when listening for personal pleasure, because you never know, the book or books might end up in the blog. That's how I worked Charles Todd's Racing the Devil (Simon Prebble), Jacqueline Winspear's In This Grave Hour (Orlagh Cassidy), and Peter Robinson's Sleeping in the Ground (James Langton) into "Ask the Detective Inspector," in which I admit that everything I know about England has been gleaned from mystery novels. Right now I'm writing "Let's Flip Jane on Her Head," about—can you guess?—all those Pride and Prejudices not written by Austen, including the one with zombies. It's going to be good fun. Hope to see you there.—Aurelia C. Scott More on the Blog! AudioFile's blog is where you'll find our podcast, The Download, as well as narrator videos, Robin's weekly roundup, and recommendations in romance, mystery, and more.